Looking to give some gifts with a little heART for Valentine’s Day? Our all-local artists have been filling our shop’s shelves with wonderful, handmade notecards, ceramics, jewelry, and one-of-a-kind items you won’t find anywhere else. 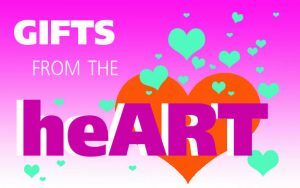 Best of all, Heights Arts members (plus our affiliate members from BayARTS and Valley Art Center) save an additional 5% on all gallery shop purchases this weekend! Stop in and shop to your heART’s content!